When it comes to identifying and developing a career pursuit, nothing beats real world experience. Internships are more than just something to put on your resume. They are a window into the world of work and how companies function. As our scholars gain professional opportunities in the workplace, they are put in a position to challenge themselves while learning about their strengths, their areas of interest and passion and their career goals. This summer 85 internship placements for high school and college scholars provided a window of opportunity and learning. 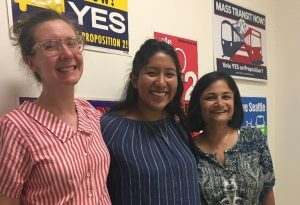 Dayanne spent her summer working for the Transportation Choices Coalition (TCC), a statewide policy and advocacy nonprofit dedicated to improving transportation choices. Dayanne researched the new King County Metro Fare Simplification Plan and wrote a blog for the TCC website. The full blog can be found at https://www.transportationchoices.org/blog/metro-lets-keep-it-simple. Dayanne has been involved in many projects while at TCC, including event support, drafting social media posts, and conducting research for future transportation outreach. “We love having Dayanne, and she is a positive influence in the office. We are very happy to be partners with Rainier Scholars. We are strongly committed to supporting young people in this program. Our hope is to have people of color come and see there is a career path in the nonprofit sector,” said Shefali Ranganathan, TCC Executive Director. Treon Triggs spent the summer as an intern for the Whitepages in Seattle, working on a variety of projects, including researching market competition, assessing potential accounts for sales outreach, and photographing building icons. He enjoyed learning to be a versatile employee, managing his own projects and trying new tasks that fell outside his assigned scope of work. 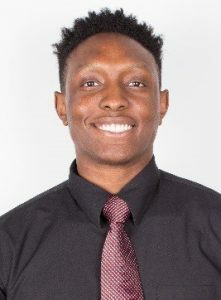 Treon felt his internship tested his skills and helped him grow to accept challenges and produce a high quality product. Beginning his junior year, he has a new understanding about how his interest in configuring and analyzing data may be used across many career paths, and he sees new job possibilities. 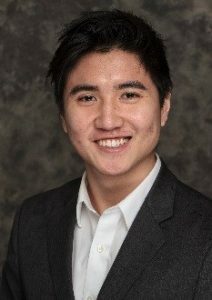 Calvin Lin recently passed the Chartered Financial Analyst (CFA) exam and spent the summer as an intern at the investment consulting firm, Verus Investments. Calvin conducted a study to quantify how people look at financial markets. Using metrics, he created a solid view of how to use the theoretical financial concepts of momentum, value and carry to determine which investments are smart. Calvin is much more comfortable talking about finance and how the industry works after his time at Verus. “I’m really happy that what I learned in school and from the CFA exam translates into what I need to know in the real world of finance. I am so much more prepared for my first career steps as a result of this internship”, said Calvin.